Few teams exemplify the roller-coaster feel more than the New York Giants. The heavy media focus for the New York team means that there is extensive coverage regardless of the season's level of success. The Giants certainly have seen success with four Super Bowl titles, including two since 2007, but it has been hard to maintain. Nevertheless, this inconsistency has not swayed the loyalty of the fan base and the Giants have one of the biggest followings in the league. 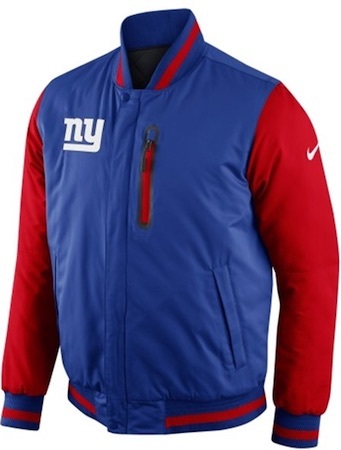 This guide offers suggestions for great gift options geared specifically toward a fan or collector of the New York Giants. The list below features 20 different gift ideas across all budgets that are sure to appeal to a fan or collector of the Giants. 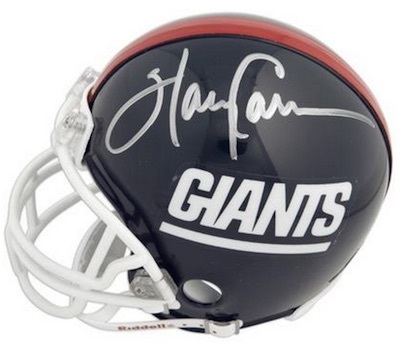 For more detailed information about the Giants, including cards and other memorabilia options, check out our detailed New York Giants Collecting Guide. Perhaps the most underrated, two-time Super Bowl MVP in history, as Eli Manning goes, so go the Giants. 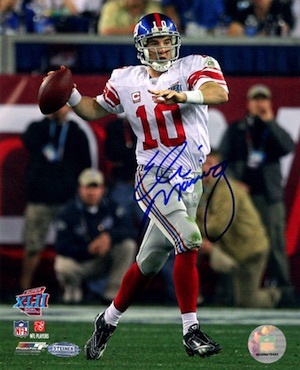 His signed photos are not cheap, but thanks to his two titles, Eli Manning will always remain a fan favorite and a popular gift option. The other big quarterback name in the team's history, Phil Simms also won two titles with the Giants along with one Super Bowl MVP. 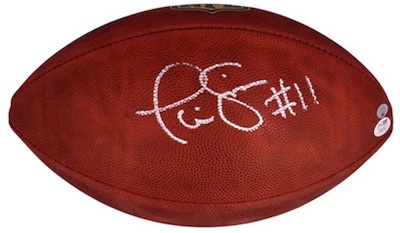 Signed footballs for Phil Simms are a nice mid-level gift option and a great display piece. 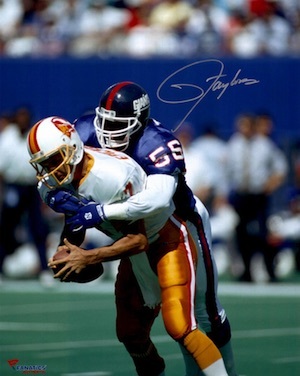 His controversial off-field actions aside, Lawrence Taylor is high on the list of all-time greats in the Giants history. The Hall of Fame linebacker was a terror on the turf and is considered of the of the greatest defensive players in NFL history. Signed photos are readily available and deals can be found. Another defensive standout for the Giants, Harry Carson is also a Hall of Fame linebacker with high regard from the fans. Many signed items for Carson, including the mini-helmet below, can be found for budget prices. 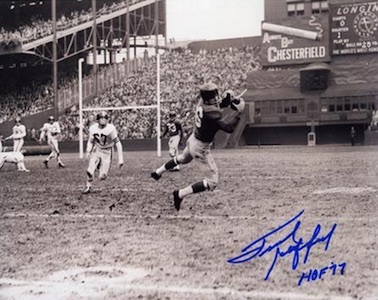 Not just a sportscaster, Frank Gifford was a Hall of Fame offensive threat for the Giants in the 1950s and 1960s. Signed photos remain in good supply and make a great gift option. A fan favorite despite a relatively short time with the Giants, Mark Bavaro was part of two Super Bowl titles in the 1980s. Signed gear for the popular player are not as plentiful as others on the list, but prices are not too expensive. 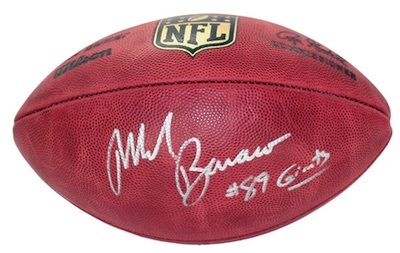 Signed footballs for Bavaro present a great gift option, especially for a fan from the 1980s. 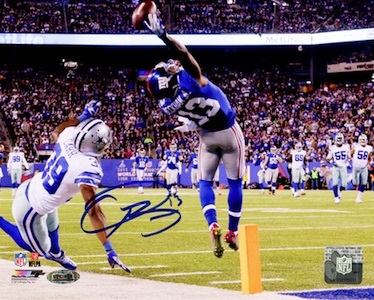 One of the newest faces on the Giants, Odell Beckham's catch, documented in the autographed image below, created an incredible surge in interest for the talented wide receiver. This memorable moment offers a fantastic gift option. One of the most popular options from the last decade and a frequent sacker of the quarterback, Michael Strahan was recently inducted into the Hall of Fame. His charismatic personality has allowed him to work in television and that has kept him in the spotlight following his retirement. This simple plaque is a great budget gift option and ideal for display in almost any setting. 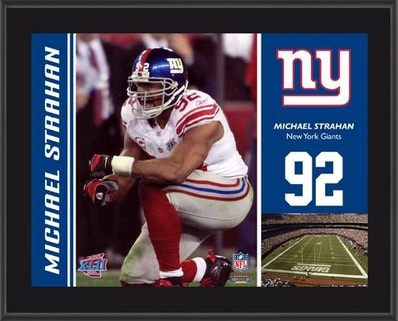 View signed options for Michael Strahan here. Another current wide receiver, Victor Cruz's skills and celebratory salsa dance has made him a popular option for fans and collectors. 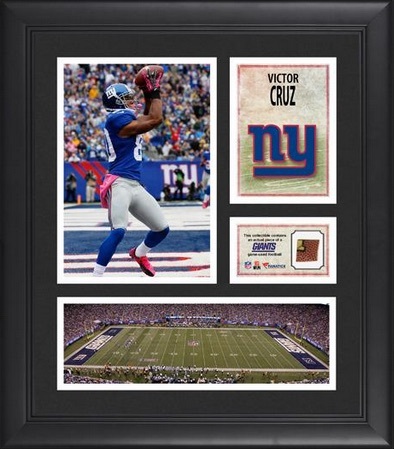 While signed items for Victor Cruz are on the more expensive side, a framed collage offers a good alternative. View other plaques and collages for the Giants here. 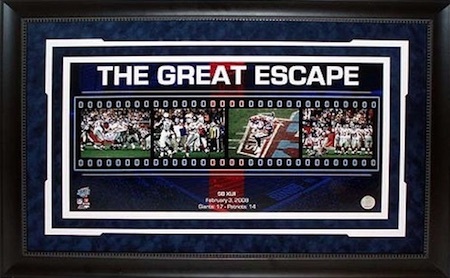 Documenting one of the most memorable moments in the history of the Giants, this framed filmstrip showcases the play where Eli Manning avoided a likely sack and heaved a pass downfield to David Tyree, who made a fantastic catch. The play helped sustain the drive that ultimately won the Super Bowl for New York. See the video here. 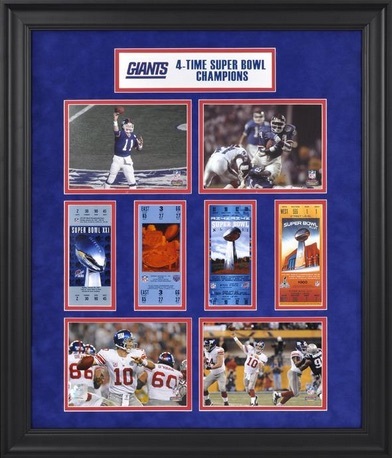 Another gift option that covers top moments for the Giants, the framed collage below includes images and replica tickets for each of the team's four Super Bowl wins. 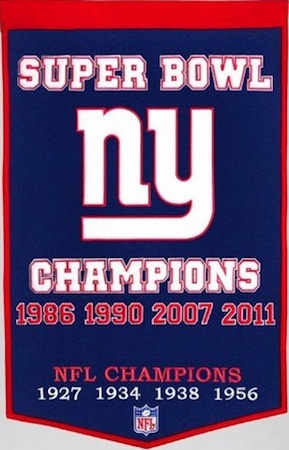 A solid summation of the team's history, the quality wool banner documents each Super Bowl win for the Giants along with their titles from the pre-Super Bowl era. The banner is ideal for a man cave or bedroom. Football cards are a popular option for fans, but they are not as simple to buy because they are so specific. 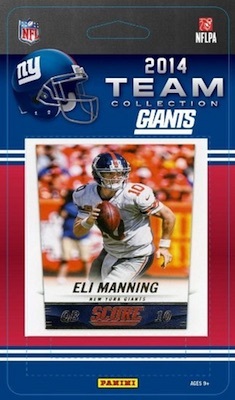 One option we recommend for budget gifts or stocking stuffers is New York Giants team sets. Some are sealed and some are hand-collated, but the result is the same. Make sure to verify the year of the card and the players included to make sure you are getting what you expect. 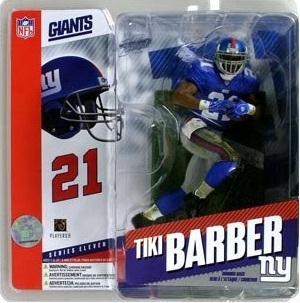 Whether shopping for a child or an adult, New York Giants figures and bobbleheads can be a great gift. Several different brands offer a variety of options and many players can be found from the history of the franchise. Check out specific figures on eBay using the links below. There are a good variety of different New York Giants team Fatheads. In addition to team logo versions, players are some of the top Fatheads and three of the most popular New York Giants are noted below. 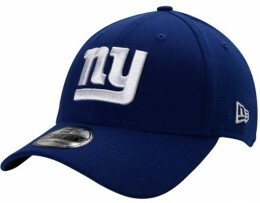 Smartphones are the new norm and can make for an easy and inexpensive gift for a New York Giants fan. Just make sure to verify the exact make and model before you buy. We have included direct links to Amazon below for the most popular phone models. 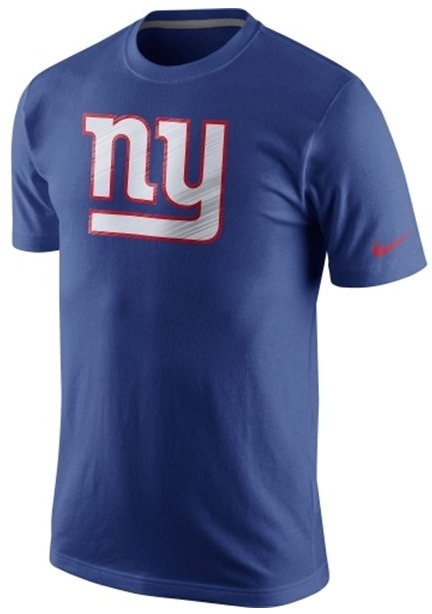 Jerseys remain the most common way for fans to display their love of the Giants. Replica versions offer cheaper prices and fans can also have them customized for added appeal. 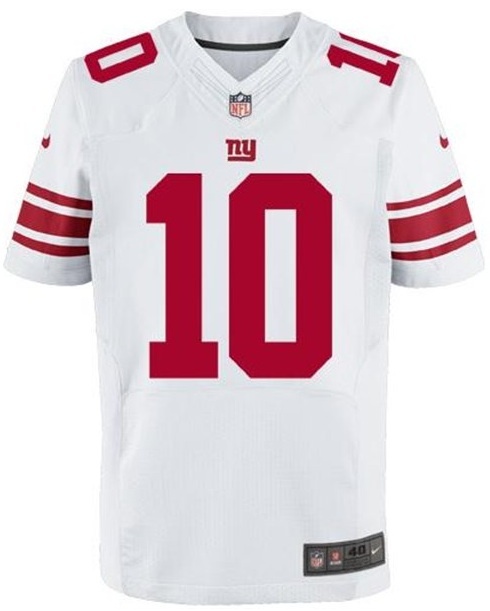 If you are overwhelmed by the many versions, check our detailed NFL jersey guide here.